Award-winning beauty is in the bag. 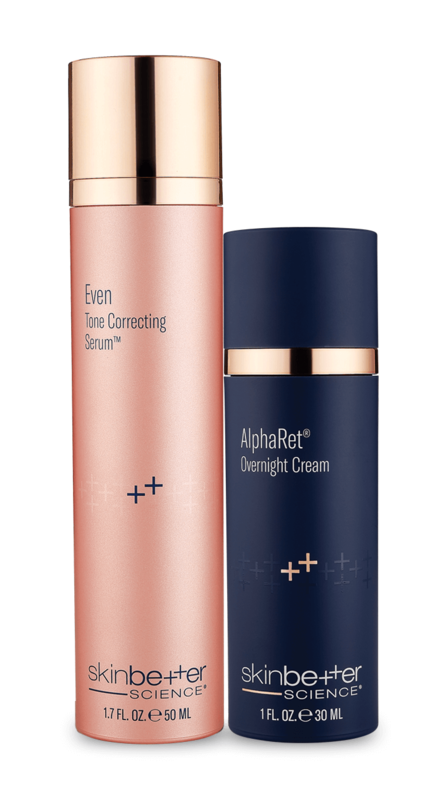 Achieve radiant, glowing skin this spring with our powerful eye recharger and our scientifically-advanced antioxidant. Use after InterFuse® Intensive Treatment LINES. InterFuse Treatment Cream EYE: Aqua/Water, Caprylyl Methicone, Glycerin, Jojoba Esters, Niacinamide, PEG-16 Macadamia Glycerides, Cetearyl Alcohol, Glyceryl Stearate, Ceteareth-20, PEG-100 Stearate, Caprylic/Capric Triglyceride, Alcohol Denat., Palmitoyl Tripeptide-38, Caffeine, s-Mu-conotoxin CnIIIC Acetate, Copper Lysinate/Prolinate, Hydrolyzed Lupine Protein, Terminalia Ferdinandiana Fruit Extract, Methylglucoside Phosphate, Sodium Hyaluronate, Saccharomyces Cerevisiae Extract, Arginine, Glycine, Hydroxypropyl Cyclodextrin, Carbomer, Hexylene Glycol, Citric Acid, Sodium Hydroxide, Ethylhexylglycerin, Caprylyl Glycol, Phenoxyethanol. Alto Defense Serum: Aqua/Water, Butylene Glycol, Propanediol, Ethylhexyl Olivate, Cetearyl Alcohol, Chlorogenic Acids, Hydrolyzed Sodium Hyaluronate, Lauryl Lactate, Dimethyl Isosorbide, Glycyrrhiza Glabra (Licorice) Root Extract, Tetrahexyldecyl Ascorbate, Ergothioneine, Benzylidene Dimethoxydimethylindanone, Arabidopsis Thaliana Extract, Carnosine, Camellia Sinensis Leaf Extract, Vitis Vinifera (Grape) Seed Extract, Theobroma Cacao Seed Extract, Curcuma Longa (Turmeric) Root Extract, Olea Europaea (Olive) Fruit Extract, Euterpe Oleracea Fruit Extract, Trifluoroacetyl Tripeptide-2, Buddleja Officinalis Flower Extract, Coffea Arabica Leaf Cell Extract, Crocus Sativus Leaf Cell Culture Extract, Superoxide Dismutase, Ubiquinone, Zingiber Officinale (Ginger) Root Extract, Ceramide NP, Ceramide AP, Ceramide EOP, Linoleic Acid, Linolenic Acid, Sea Whip Extract, Bisabolol, Tocopherol, Tocopheryl Acetate, Cholesterol, Phytosphingosine, Jojoba Esters, Sodium PCA, Pentylene Glycol, Methyl Gluceth-20, Glycerin, Helianthus Annuus (Sunflower) Seed Wax, Acacia Decurrens Flower Wax, Lecithin, Sodium Lauroyl Lactylate, Dicetyl Phosphate, Propanediol Dicaprylate/Caprate, Polyglycerin-3, Ceteth-20 Phosphate, Diisostearyl Malate, Xanthan Gum, Steareth-2, Acacia Senegal Gum, Carbomer, Acrylates/C10-30 Alkyl Acrylate Crosspolymer, Dextran, Sodium Hydroxide, Citric Acid, Disodium EDTA, Ethylhexylglycerin, Phenoxyethanol.